Sports are an important part of growing up. Whether their watching, enjoying, taking part or training hard, it all helps to build character and nurture a winning spirit. They same applies to scripture, like this sensational Bible verse: I can do all things through Christ who gives me strength  Philippians 4:13. Support your childs spiritual and physical development with this fun childrens t-shirt. 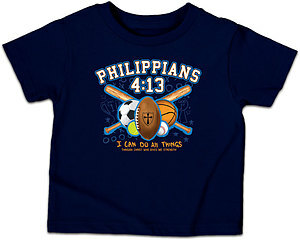 With this encouraging scripture strapped to your kids chest, whether theyre playing football in the park or playing FIFA on their Xbox, theyll always be reminded that Gods on their side. T-Shirt Text: Philippians 4:13. I can do all things through Christ who gives me strength! All Things Kidz T Shirt: Blue, Children's Large was published by Kerusso in September 2012 and is our 38590th best seller. The ISBN for All Things Kidz T Shirt: Blue, Children's Large is KDZ1093LG. Be the first to review All Things Kidz T Shirt: Blue, Children's Large! Got a question? No problem! Just click here to ask us about All Things Kidz T Shirt: Blue, Children's Large.